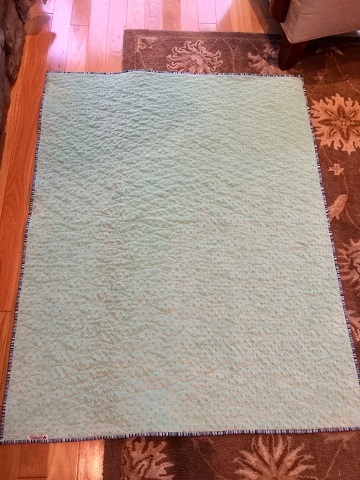 Thanks to the helpful suggestions of others on the QB, I have finished up my first minky backed quilt without a hitch! Walking foot wavy quilted lines were stitched with Superior Bottom Line thread (top & bottom) and it worked beautifully on the Juki! I would make another crib sized minky but nothing larger - it's a lot to lug under the needle. Of course, I may change my mind if I ever splurge on a longarm. It's a real pretty 'boy' quilt. I love the fabric you used in the binding. I haven't tried quilting Minky yet. Yours turned out great. Thanks toogie - the pictures really don't do justice to how stinkin' cute this quilt really is.. The fabrics are much more brilliant and the navy blue has a cute little whale print. A dear friend purchased the fabrics and I simply made the quilt for her to give to a co-worker (unknown to me). The minky is actually mint green. Great finish...I’m glad you had a good experience with minky. I found it fairly easy to quilt on my DSM and it makes for a cuddly quilt. Great job with that minky, Christine. I have some but I'm too intimidated to use it! The little whales are adorable. Such a sweet & comfy looking baby quilt. I'm so glad you had good results with the minky fabric. Very nice, it looks warm and soft! Fun quilt and will be loved. The minky is a great finish. It would surely be soft and cuddly. With your talent and your new Juki, quilting minky will be a breeze! I forgot to mention that I also followed the advice of many and spray basted plus pinned very closely, using a 90/14 top-stitch needle with the poly thread and a walking foot. Never had a thread break or any bunching of the minky - thanks to all of the wonderful QB guidance! Beautiful! What is the pattern? That's a darling quilt for a baby boy! 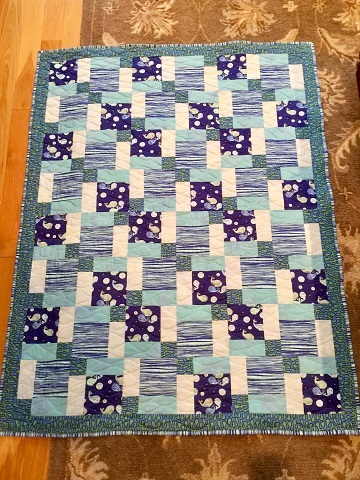 Very nice baby boy quilt! Very cute quilt! It will be loved by that little boy! I followed Donna Jordan's Disappearing Nine Patch quilt pattern and adjusted the border down. Here's a link to her video - super simple! Thanks for all the tips and links. It's a cute "boy" quilt. Sounds like the process was fun and a learning experience. It's wonderful, Christine. I like the fabrics you used. Congratulations on your success with the minky. Thank you for posting your awesome quilt. I like the whale fabric you chose. I appreciate the link to the disappearing 9 patch pattern. The video has lots of tips. The minky back is sure to be snuggly. You have inspired me to try this quilt. I like that you can use the 5" precut squares for the 9 patch if you wish. Happy quilting! Congratulations on your dive into minky backing. What a great finish!